Sarkar poster with shot of Vijay smoking removed. 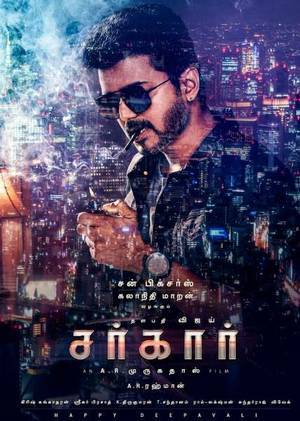 Following a notice from Tamil Nadu’s Health Department to the makers of actor Vijay’s Sarkar over the posters which featured him smoking a cigarette, the said poster was removed from the official social media pages of actor Vijay , Sun Pictures and director A.R. Murugadoss. The poster elicited sharp reactions from political parties, especially the Pattali Makkal Katchi, whose leader Anbumani Ramadoss criticised the actor via a tweet on the day the poster was released on social media. “Shame on Actor Vijay for promoting smoking in this first look of his next movie,” Dr. Anbumani said, urging the actor to act responsibly and not promote smoking.The Tamilnadu People’s Forum for Tobacco Control (TNPFTC) has appreciated the Health Department for taking action against posters of Vijay-starrer Sarkar.Finally Sarkar poster with shot of Vijay smoking picture was removed.